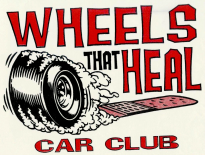 Welcome to the Wheels That Heal Car Club, a non-profit organization founded in the fall of 2003 with the purpose of conducting car shows and car events for the benefit of local charities and families in need. Please join us in making our community better. Membership application. Sponsorships welcome.